Students will decide as a class how they will impact their community by using art. Students will each come up with an individual idea and then present their idea to the class. As a class students will analyze the ideas looking at how many people they will impact, the cost of the project, fundraising, and the likely-hood they can carry the idea out within the course of the trimester. A teacher gives an assignment Think of an idea to change our world and put it into ACTION! A boy begins to dream about how he could help people in a way that they could not help themselves and in turn they need to repay the favor to three other people. This would then start a chain reaction to chain the world for the better! Mel Chin, an artist, started a project called operation pay dirt. 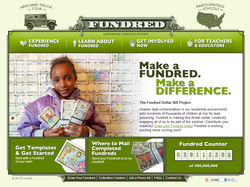 It involved students creating artwork on "fundred dollar bill." In hopes of bringing their artwork to congress to ask for an exchange of money to help the lead contamination that was occurring in the soil in New Orleans. Click on the image to learn more about Mel Chin's Fundred Project. 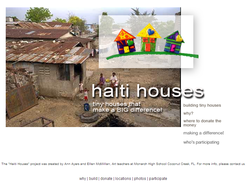 The "Haiti Houses" project was created by Ann Ayers and Ellen McMillan, Art teachers at Monarch High School Coconut Creek, FL. 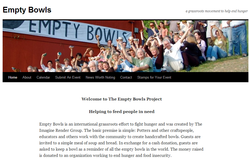 Empty Bowls is an international grassroots effort to fight hunger and was created by The Imagine Render Group. 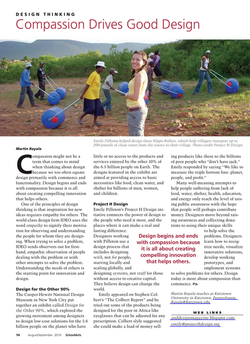 Click on the image to read about how Emily Pilloton designed these Hippo Rollers and the difference her design made! 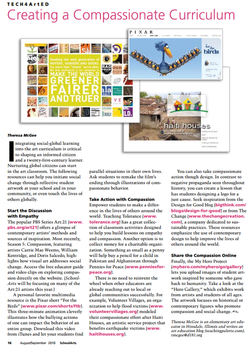 Click on the image to explore more ideas from School Arts Magazine & Theresa Mcgee! Click Here to see the online items! Bidding NOW CLOSED! This commercial is a great example of how you as a middle school student can make a difference! 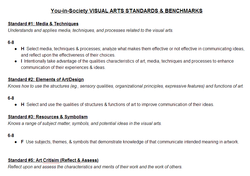 Click on the image to see the Waverly-Shell Rock & National Art Standards in which this project meets.